State DOT maintenance practices regarding pavement ruts vary in both the type of concern and the dimension of that concern. Where one state seems concerned about pavement smoothness and rideability, another seems concerned with vehicle tractability, and yet another seems concerned about hydroplaning potential. In specifying the dimensions of critical rut depth, the values range from 0.2 inches up to 0.8 inches. With regard to hydroplaning on higher speed highways, no clear standards have been advanced, first, of what are critical water depths for hydroplaning at various speeds, and second, of what rut depths will create critical water depths. A companion paper on this website titled, Roadway Hydroplaning – A Framework to Determine Critical Pavement Wheel Rut Depths, deals with these issues and provides rational recommendations. The focus of this article is how rut depths are measured to determine their capacity to hold water. The most widely recognized method of measurement is to, (1) place a 3- to 4-foot rigid straight-edge perpendicular to the roadway across the rut and, (2) measure vertically from that straight edge to the pavement at the maximum depth of the rut. When the concern is hydroplaning, however, this measurement does not directly account for the ability of the rut to carry or hold water. This method tends to over-estimate the capacity (maximum water depth) of the rut to hold water unless an adjustment is made for the slope of the straight-edge. Another more intensive method uses surveying equipment to measure a cross-section of the roadway. But unless this method measures elevation at very close lateral intervals it will tend to under-estimate the rut depth by missing the high and low points associated with the true rut depth. Yet another method uses computer controlled electronic equipment in a moving vehicle to scan pavement elevations. But this method, because of a limited number of lateral sensors, also tends to under-estimate the rut depth. Deep ruts can generally be identified quickly because they can be seen or felt in driving on the roadway. Ruts that may be problematic for hydroplaning can also be identified by their water accumulation during wet weather. In addition, even lesser ruts should be looked for at typical problem spots such as on steeper grades, in curve transitions, and in sag vertical curves. 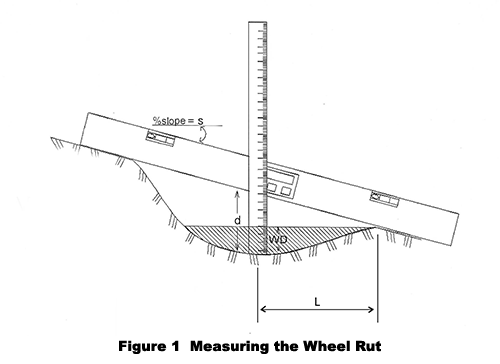 When measuring down from a straight edge to the deepest part of a rut, that reading is only part of what is necessary to determine the amount of water the rut can hold. The slope of the straight edge and the lateral position of the reading within the rut is also important. For steeper cross slopes, the maximum water depth may be small or non-existent. For a flat cross slope, the maximum water depth will equal the reading. 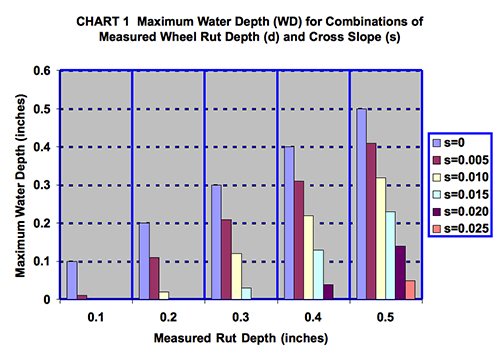 Assuming a nominal wheel rut width of 36 inches with a maximum depth measure at its center, Chart 1 shows the maximum water depth (WD) for various combinations of measure rut depth (d) and cross slope (s). The companion paper on this website titled, Roadway Hydroplaning - A Framework to Determine Critical Wheel Rut Depths suggests that the critical water depth to cause hydroplaning is about 0.1 inches. Looking at Chart 1, this water depth criterion indicates that, for a standard DOT cross slope of 2.5% (0.025 in./in. ), pavement ruts up to 0.4 inch will not retain any water at all. On the other hand, cross slopes of 0.5% (0.005 in./in.) or flatter (that occur because of faulty paving or repaving) may cause concern for hydroplaning with rut depths as little as 0.1 inches.